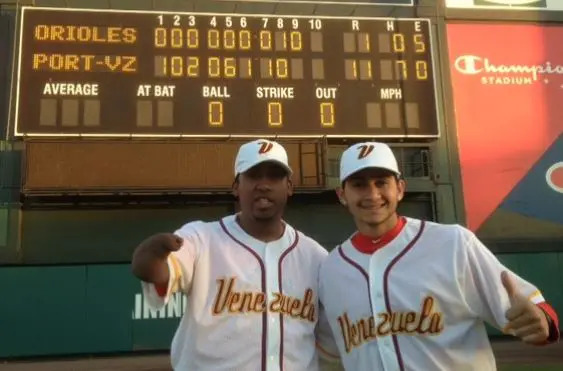 Orlando, Fla., Jan. 17, 2013 — Andres Castro and Carlos Mustiola threw a combined no-hitter today as their Deportiva Venezuela team defeated the Chicago Orioles 11-1 in the opening round of MABL division at the Holiday Classic at Disney. The no-hitter, thrown in Champion Stadium, was the first in the 14 year history of the event, according to tournament director Gary D’Ambrisi. Castro, the starter, threw eight no-hit innings, but ran into control problems in the eighth inning to give the Orioles their only run. Mustiola threw a hitless ninth inning to cap the no-hit bid. The tournament, being held at the ESPN Wide World of Sports Complex, concludes Monday.